Under a perfect blue autumn sky, children frolicked, horses played and old friends mingled with new friends while listening to Henry Pugh make his music. This was the scene at the Hog Killin' Time Barbecue in Smuteye. 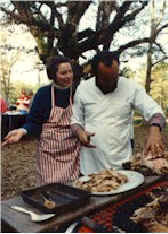 November 3rd marked the 12th annual whole-hog barbecue that Major and Margaret Cox prepared for friends and guests at their Bullock County farm. Major's great grandfather started the Hog Killin' Time Barbecue tradition early in the last century. Then, this annual gathering provided him an opportunity to identify the folks that would help him harvest his fields of cotton. Today, the Coxes host this event to celebrate Major's birthday; this was his sixty first. Major's brother, Charles Cox, assisted Wayne Jones, captain of the pig roasting team. Charles and his wife, Phyllis Cox, arrived earlier in the week from their home in Santa Barbara, California. Chick Cleveland returned as bonfire master, with his wife Fran Cleveland and four deputy firemasters, grandsons Ethan, John Will, Austin, and ____, joining him. Dalton Kuder also assisted with the roasting. Dalton, Margaret and Major's longtime friend and flight instructor when they lived in Puerto Rico, came with his wife Robin Moore. They flew their airplane from their home in Corpus Christi, Texas and landed at the airport in Troy. Others joining in the festivities included: Arlam and Johnnie Carr, Don and Ursula Nolte, Chris and Leah Dubberly and their daughter Meredith, David Walker and his friend Annette Reid from New York, Don and Cheryl Bogie and daughter, Carla, and son, Justin, Alan and Joan Hackel, Tess and Lou Ware, brought the Artaquiette family whom they are hosting for the International Officers School at Maxwell Air force Base. Sherrod and Sharon Hixon of Perote, came with their daughter Marna Aragon and her husband, Fernando Aragon, and their son, Rafael, who reside in Union Springs. Others attending from Union Springs included Wilbert and Margaret Jernigan who came with son, Jeff, and John McGowan. Neighbor and cousin, Fred Cox, brought his new friend, Catherine Wilson of Hattiesburg, Mississippi.